sBÖHM has always been less known compared to the leading headphone brands on the market, such as BOSE, Sennheiser, and the others. However, after the immense success with its’ model BOHM B-66, they decided to deliver the technically enhanced model, BÖHM B76. We have written in one of our previous articles about the features, design, and performance of the BÖHM B-66, and it is not enough to say that these are one of the most pristine models for less than $100. In this article, we are going to focus mainly on BÖHM B76 Review, and whether does it outperform its’ predecessors or not. The headphone’s predecessor, B-66 is feature-rich, which made the headphones stand out immensely. 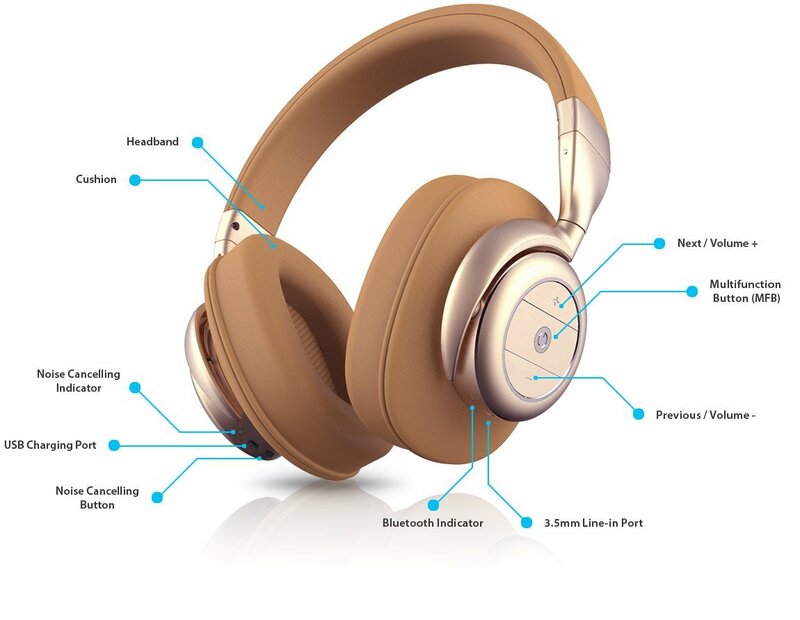 Features on every headphone are important, mainly because they are held accountable for the overall performance headphones. BÖHM B-76 feature Bluetooth 4.0, Active Noise Cancellation, Enhanced Compatibility, and strong Battery life. BOHM B76 is a wireless over-ear headphone that streams the music via the Bluetooth. With the Bluetooth V4.0, you are finally rid of the persistent, annoying wires that can bug you, which is great for the people who prefer to use headphones during their sports endeavors. Along with the Bluetooth, there is the CSR solution, which enhances the quality of streamed music via Bluetooth. The CSR chip is often found along with the Apt-X codec in the headphones of the latest generation, meaning that BÖHM B-76 loyally follows the exponential growth of technology. The Bluetooth indicator is located under the right headphone’s pad to ensure that the connecting is easy. All you need to do is to activate the Bluetooth and find the headphone over your mobile phone or tablet. The range of the Bluetooth is 33 feet (10 meters) meaning that you can use these headphones in the gym, while doing chores, studying, or working. It doesn’t hurt to mention that the headphones support various protocols including A2DP, AVRCP, HFP, and HSP. Although the Faux leather cushions located on the pads provide solid isolation from the background noise, the manufacturers thought that the physical protection is simply not enough. This is why they added the Active Noise Cancellation technology, which is located on the rear of the left ear pad. The active noise cancellation, in fact, does an excellent job of preventing the noise from entering the headphones and mess up your music experience. This feature does a good job by keeping the noise out, but there is definitely more room for the improvement. It closes out the noise of up to 20 dB, but it is far from perfect, whereas other headphone models in the competition close out your ears from the noise in a better manner. BOHM B76 uses the 320 mA battery which handles the music output, and active noise cancellation with the pure excellence. This battery allows you to listen to the music on a higher level. It offers up to 16 hours of pure listening to the music or watching movies, which makes BÖHM B-76 ideal for the traveling that can last. Furthermore, the active noise cancellation durability of 8 hours is a decent deal for the headphones around $100. The average charging time of the battery is around two hours. BÖHM B-76 offers a great variety of the compatibility options thanks to the Bluetooth 4.0. 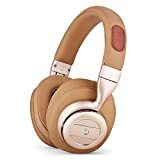 As a result of this growing, wireless technology, you can connect these headphones on just any Bluetooth-friendly device, including all Apple’s products, even the latest iPhone and iPad models, Android devices, tablets, laptops, computers, and a large specter of other mobile devices that support Bluetooth. The features this model offers is the slightly enhanced version of what BÖHM B-66 has to offer. However, the noise cancellation didn’t see the ultimate improvement like we were hoping, hence the number of stars we give it is 4. The second point of these headphones that we put into consideration its’ design. It is important to mention that they are very feature-rich in terms of design as well, and just like with the previous model, we were merely surprised to see the metal construction headphones at around $100. Just like the previous model, these over-ear headphones are available in two colors black with the silver accents, and brown gold. Below, you can find out about the design that makes them stand out from the crowd. Like mentioned, BÖHM B-76 sports metal build, brushed aluminum and steel to be more precise. Metal build ensures that the headphones are more durable, and are going to offer the safeguard in loyally serving you for a long time. The pads are covered in faux leather and memory foam that isolates the ears from the ambient noise, preventing it from entering the headphones. The headphone market is extremely versatile but rarely does it offer the option that will fit all types and shapes of the ears. We can freely confirm that the BÖHM B-76 are an exception. The over-ear design fits any kind of the ear and ensures a long-lasting comfort without the headaches, dizziness, or hot, sweaty, or painful ears after the extended amounts of time listening to the music. BÖHM B-76 belongs to the portable group of headphones. It is significantly heavier than its’ on-ear predecessor. However, they still feel relatively lightweight and fit well onto the ears. It doesn’t hurt to mention that the headphones are foldable, ensuring the higher level of portability, and ability to access them much easier, without making them break, and without taking too much of your working space, or space in the bag. The headphones come with the sturdy black bag which secures its’ safety. Whenever you are traveling, you can put the headphones in the bag, making sure that they won’t take the damage which threatens its’ lifespan. We were pleased with the overall design, and the features regarding of it, which is why we award BÖHM B-76 with the highest grade for the design department. If you are looking for the immense sound quality and performance in particular in a pair of headphones, you shouldn’t search further than BÖHM B-76. We will review the quality of the sound-stage and the controls below, and we hope that you will be as amazed as we are. Thanks to the implemented 40mm drivers, we are able to listen to our favorite music on an extended frequency range. This results in a detailed, clear, and loud music, and by detailed we mean that you are able to hear every string and tone of your songs in general. The bass is also great and dynamic. The Very important detail that we noticed is that the performance of the bass increases as we turn on the active noise cancellation. The mid-response is solid, and the highs are mesmerizing. All in all the headphones deliver solid and balanced soundstage with the dynamic bass that is not too overwhelming for the listener. The sound controls are easier to access than B-66. The buttons are more comfortable and easier to reach. The only button that is important on the left side is the ANC button that lets you control the ambient noise. On the right side, you can control the volume, next/previous song, and answer the calls. BÖHM B76 are equipped with the inline microphone which allows you to make and answer calls completely hands-free. It is a good feature. Unfortunately, the microphone doesn’t live up to the quality of the B-66. While the quality of the conversation is clear, the microphone is very silent and it will often force you to speak loudly, or even yell in order, for the other person to hear you. The performance of the headphones is outstanding. However, the muttering performance of the microphone results in a lower grade. BÖHM B76 are currently at a discount. I can say that price is worth of what they have to offer. You will not find better headphones in this price range, mainly because of the active noise cancellation. We believe that it is a great deal for delivering amazing sound, offering nice connectivity options, and the active noise cancellation. The microphone is too silent. The package comes with Hard Case for the headphone. It also includes a Charging cable to charge the headphone. It comes with an Auxiliary cable, in case you don’t want to use the Bluetooth and want to connect to your music device with a cable. BÖHM has once again proved to have a joker up their sleeve. BÖHM B-76 delivers a great value backed up with the large selection of features, and everything that an average audiophile is asking from the budget headphones. They delivered the vast improvement from the B-66 model and earned our trust. If you would like to orientate to a more budget option, we offer the amazing Cowin E-7 that is now at a discount, and if you would like to test the on-ear design, take a look at our BÖHM B-66 on-ear headphone review. Bohm B-76 is a pair of wireless Bluetooth V4.0 headphones with the Active Noise Cancellation. It comes with a great variety of features including the 16 hours battery and sturdy and comfy design. The soundstage of the Bohm B-76 is amazing, and the power backs it up in a dynamic manner. While they are far from perfect, they are nearly a diamond in the rough.